Since 1985 Enterprise Plumbing Inc. has been a family owned company servicing homes and businesses of all sizes with many different plumbing issues in a multitude of Counties. We only focus on plumbing, not heating and air (HVAC) or electric. Are we perfect, no but we sure try to be! We do have a great circle of trade friends we can refer to you that only focus on their specific trade. Call 630-365-9710 or contact us for that preferred list of friends. From Plainfield to Algonquin and everything in between. Our service plumbers are dispatched from their individual homes and rarely have the need to come back to the main office and this cuts down on travel and maintenance. From simple faucet or toilet repairs to installing a bathroom plumbing system in the basement to large custom homes or a commercial tenant build out. We seriously do it all. All of our field techs are constantly updating their professional plumbing skills as well as safety credentials and yes, we are fully insured and will send you a certificate of insurance on request. For our residential service customers we show up in a fully stocked truck with hundreds if not thousands of special parts and tools to help eliminate the need to inconvenience the customer with a second or even a third trip. Most of our trucks have multiple drain rodders or sewer cameras on them for those troublesome slow or clogged drains or even broken sewers. Click Residential or Commercial to view our photo gallery of some of our projects, large and small with some before and after photos. 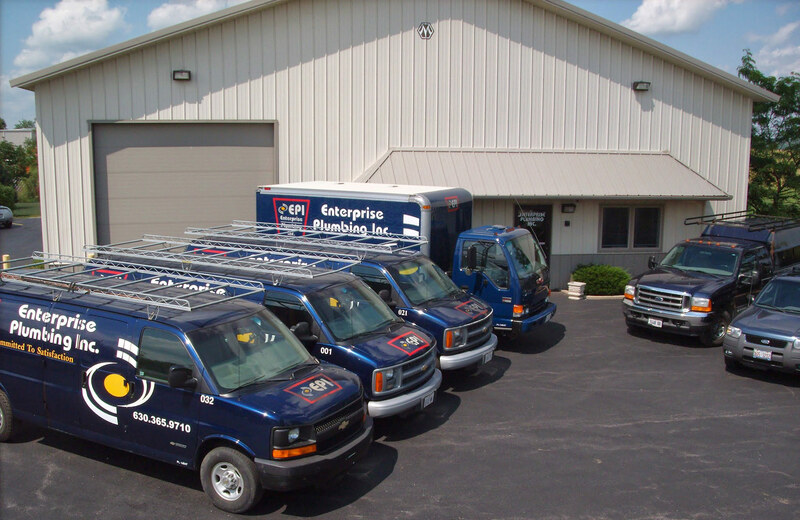 Call 630-365-9710 to schedule an appointment with Enterprise Plumbing today!